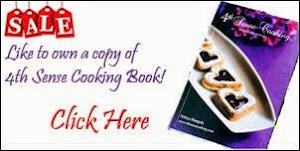 You would always need some handy quick fix recipes to fulfill the 4 PM tummy grumbling. Mostly people end it up by having a cup of coffee and munching some fried snacks. But I am a no coffee, no tea person and I am not for fried items too. So a healthy salad, or a non fried snack is what I keep looking for. Its a bajji that is roasted on a pan and not deep fried :) Wow, so isn't it a diet version??!! Cut the ends of the bread and slice them diagonally to make triangles. Grind onion, ginger and garlic together into a fine paste. Take a large flat bowl and mix in the besan, rice flour, salt, chilly powder and the ground ingredients by adding some water into a thick paste (like bajji batter). Finally add few drops of lemon juice and mix it well. Heat a pan or skillet. Dip the bread into the batter on both the sides and roast them on the hot skillet by adding few drops of oil to it. Remove from pan when it is roasted golden brown on both the sides. 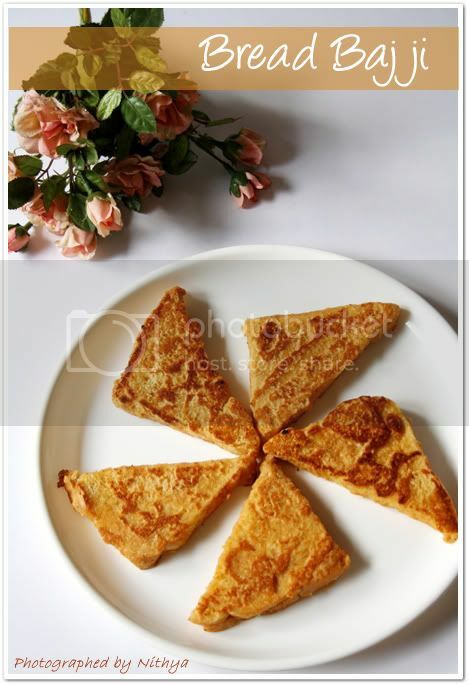 You can replace besan flour with corn meal flour as a variation. Add chillies while grinding the onions to give the extra spice. Deep fry them if you are not diet conscious. droolworthy,yummilicious and healthy bread bajjis. 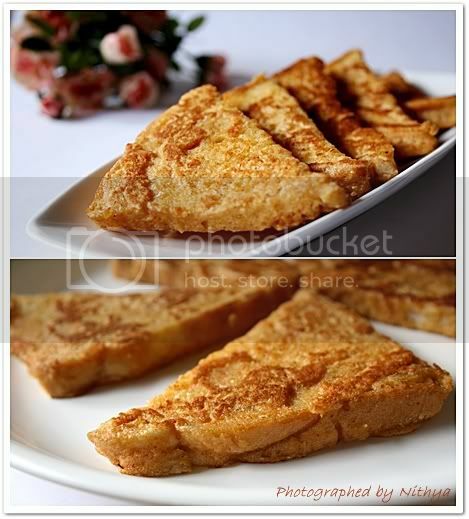 Hmmm you can also rename it was veg version of french toast .. looks awesome dear ! At first I though it was french toast!! Nice batter. Roasting was a nice option. Your clicks are as usual ind blowing. 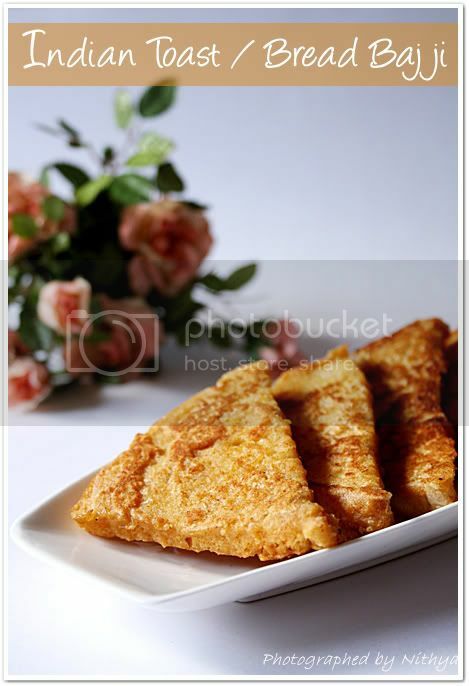 Healthy Toast,luks very tempting...Asusual Beautifull pictures. Anything with bread I am in...sounds tasty and yummy....I have almost the same version with the name Bread besan toast...Luved the first click! Beautiful pictures, Nithya. Love this idea! I too thought its a french toast and nice version. Great toast..my favourite too..lovely click. 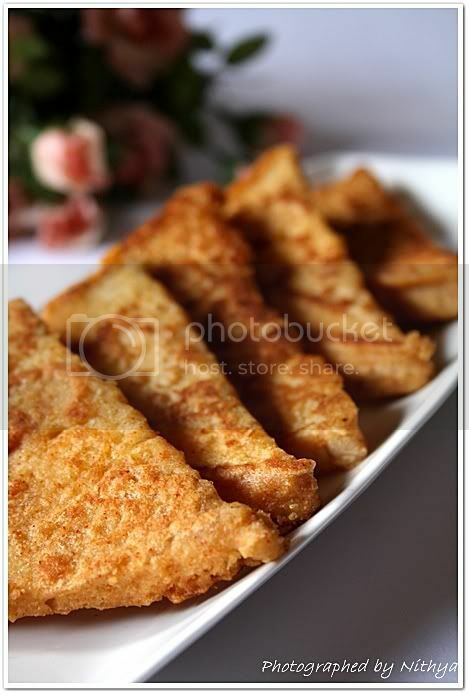 I love bread bajji... they look so yummy! Wonderful recipe and lovely pics.. Fantastic, fabulous and yummyilicious bread bajji...love it..
Yah i second sharmi as i too make the besan toast this way with chopped, chilli, onion and coriander..which goes yummy with mint chutney and tomato ketchup..Wish I am there to pick a slice from the screen..
Looks wonderful, wow, it has been like forever since I had this. I loved the healthy version! gonna try soon! Looks so delicious bajji..I too make this but deep fried..your looks so healhty with pan frying..sure will try your way next time. 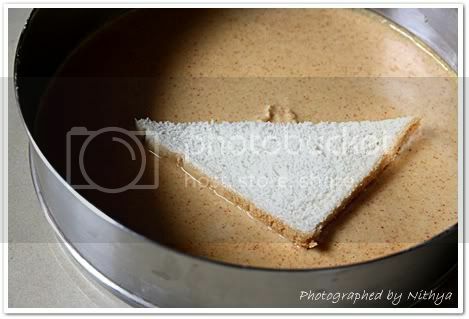 that is definitely yummy... awesome clicks!!! very healthy idea.. looks really tempting dear.. thanks for sharing !! A comforting food on weekends. Good clicks. Remind me of the the same recipe my mother prepares. We also do the same way except the lemon as an ingredient. A crunchy yummy toast! I would love a bite! Perfect tea time snack, and no guilt..
Wow...bajji looks wonderful and yummy. Nice clicks. New Diet Taps into Innovative Concept to Help Dieters Get Rid Of 20 Pounds in Only 21 Days!